It has been quite some time since we wrote about Ethan specifically. As we have said many times, his healing progress should be measured in weeks and months, not days. We are affectionately calling this Ethan Time. With this context, Ethan has made so much progress in the past few weeks and definitely the past few months. Ethan just passed 11 weeks in the hospital. He continues to breathe on his own without assistance from a respirator or additional oxygen. He also swallows on his own. This is evident during his speech therapy sessions, when he is given small amounts of pudding or applesauce and he successfully swallows them. 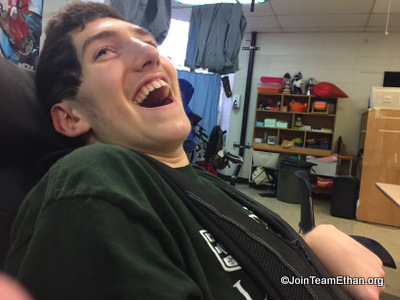 Ethan remains focused on his therapies (speech, physical and occupational), which work to keep his muscles stretched and active. These therapies also work to reestablish connections and pathways between his hands, arms and legs and his brain. Ethan is moving his mouth, tongue and neck a lot more than a few weeks ago. He is still not purposefully moving his arms and legs on a regular basis. However, he has occasionally responded to directions regarding sticking his tongue out. Ethan has strong vocal sounds (vocal cords – okay) but is not yet speaking or communicating in a way that we fully understand. He gets agitated and vocalizes in a way that is between a cry and a moan. His agitation sometimes comes from being uncomfortable (sweaty, needing a position change, etc.) or other times as a result of the neurological simulations that he has difficulty processing. All of these changes are significant to Ethan and to us, and we realize we have a long road ahead. We do not know how much longer Ethan will remain as a patient at Cincinnati Children’s Hospital. We know he will exceed the average rehabilitation stay of 12 weeks, but exactly how much longer is not defined. We will have a Team Meeting with the Rehabilitation Team this coming Friday. We are trying to return to some of our normal routines as we have settled into the start of school. Zakary is back practicing tennis twice a week in preparation for the Spring 2014 tennis season, and he is active in the Rockdale Temple NFTY youth group. Elyse is enjoying the Fall soccer season, plans to play Flag Football at school and join Student Council. We are keeping track of the Cincinnati Reds’ run for the playoffs and keep hoping the Cincinnati Bengals live up to everyone’s tall expectations for a winning season and a playoff win too! As these activities pass, we keep Ethan updated too. With the High Holy Days behind us, we look forward to an exciting year ahead. We have high hopes and expectations for the new year and have prayed harder than ever that it brings good health and happiness to all of us—that extends to everyone who has joined us on our journey and is following our Caring Bridge Posts—and a year of healing and strength to Ethan as he fights his way through the rehabilitation process. P.S. – We do not receive your email address when you post on Caring Bridge unless you include it in your text. If you want to communicate directly with us, please use ethan.kadish@gmail.com.